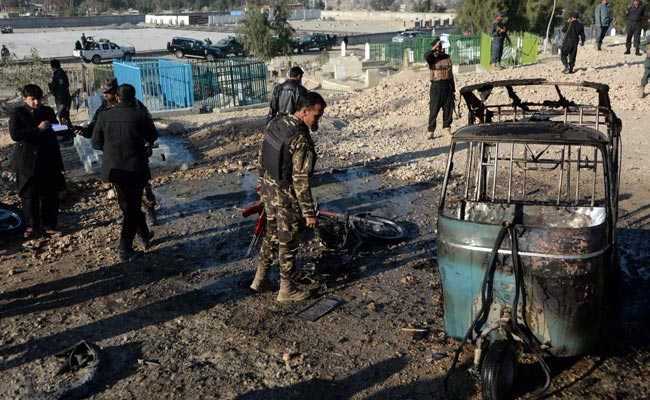 There was no immediate claim of responsibility but Taliban and Islamic State militants have stepped up assaults in recent months, with ordinary Afghans bearing the brunt of the violence. Afghan Funeral Attack: Another 14 were wounded. All the casualties were civilians. There was no immediate claim of responsiblity for the blast which authorities initially said was caused by a suicide attacker but now believe was triggered by explosives attached to a motorcycle. The Taliban said on Twitter they had nothing to do with the incident -- the latest violence to claim the lives of civilians in the war-torn country. The explosion happened during the funeral ceremony for a former governor of Haska Mina district who died recently of natural causes, a statement from the governor's office said. The twisted wreckage of a motorcycle -- a popular mode of transport in impoverished Afghanistan -- lay in the dirt at the cemetery. The Middle Eastern jihadist outfit has gained ground in Afghanistan since it first appeared in the region in 2015, and has scaled up its attacks in Kabul and elsewhere, including on security installations and the country's Shiite minority.